The JUST is He Who is fair and is too exalted for oppression orinjustice in His Divine Acts and Judgments; He gives everyone his due,puts everything in its place, and deals with absolute justice. About Hisjudgments concerning human beings Allah says, “That man canhave nothing but what he strives for; That the fruit of his striving willsoon come in sight.” (NAJM, 39, 40), “Asfor the Righteous, they will be in Bliss; And the Wicked they will be inthe Fire.” (INFITAR, 13, 14). 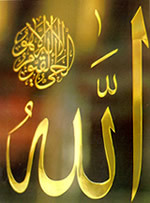 Allah’s Justice can not be properly known unless one perfectly estimates His Divine Acts. The contemplator sees that every single thing is put perfectly in its place, the causes and effects are set in the most perfect and refined pattern; the hidden aspects of the Judgments of theJUST are far more than the manifest ones. Allah’s creatures turn, in this world, between His Justice and His Gracious Favours, if the human being is afflicted with miserythen this happens in accord with His Justice; Allah, Praise andGlory be to Him, says “..nor is thy Lord ever unjust in the leastto His servants.” (FUSSILAT, 46), “..butGod never wishes injustice to His Servants.”(GHAFIR, 31). If any good befalls him, this is a favour from Allah as He said,“Whatever good happens to thee is from God; butwhatever evil happens to thee is from thy own soul.” (NISAA’, 79), “..for God is Lord of grace abounding”(BAQARA, 105), “And great is the Grace of Godunto thee.” (NISAA’, 113). It is Allah Who has endeared the true Faith to the Believers, He says, “But God has endeared the Faith to you and has made it beautiful in your hearts, and He has made hateful to you unbelief, wickedness, and rebellion; such indeed are those who walk in righteousness. A grace and favour from God.” (HUJURAT, 7, 8), and He, Glory be to Him, conferred a great favour on the believers by saying, “God did confer a great favour on the Believers when He sent among them an Apostle from among themselves.” (AL-I-‘IMRAN, 164), and He says of the pagans, “But God wronged them not; nay, they wronged their own souls.”(NAHL, 33). Allah had been existing while the universe was non-existent, and it is never unjust to rule in one’s kingdom; Glory be to the JUST,Praise and Glory be to Him, He is Allah.